Statistically and logically a run of trading at ten outdoor events over ten consecutive weekends in the British Summer was always going to be a risk, we were going to get rained upon at least once. So as the weekend of our final Summer event at Herne Bay approached we crossed our fingers, could we squeeze just one more gorgeous Sunday out of this years splendid Summer? We hadn’t reckoned with ex-hurricane Bertha plodding her way across the Atlantic. Of course there was the slim chance that she’d miss us, but as we erected the Junction Ten gazebo under a grim and grey sky it was clear that she hadn’t. First came the rain, lots of it. 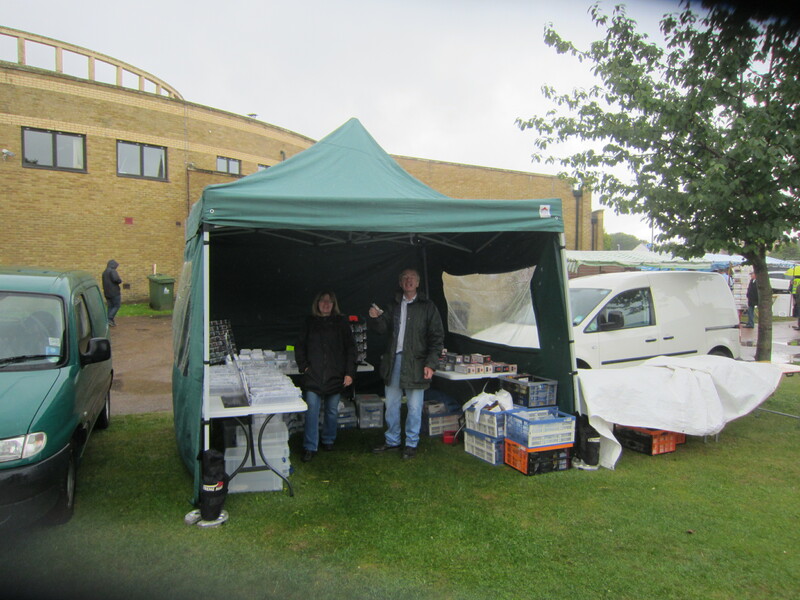 Fellow trader and event organiser Nigel Coupe had resigned himself to wait until the afternoon to set up his stall, when (according to the forecasts) the rain would have passed. 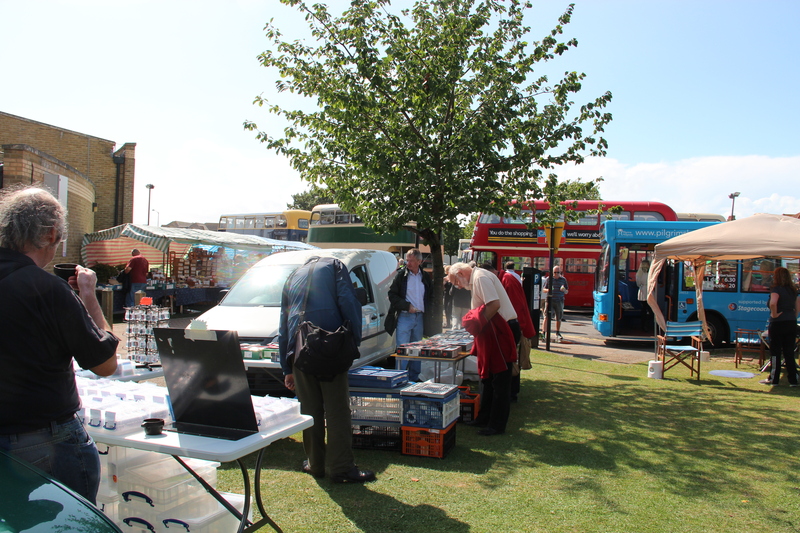 However, there was plenty of room for him to set up a table under our shelter at which point the Junction Ten Gazebo became a mini shopping mall, or even a department store with Nigel selling his models alongside our magnets and coasters! Then came the wind in several violent and sharp gusts, at one point managing to shift the gazebo slightly to an angle despite it being heavily weighed down. Subsequently Gina, Nigel and myself became experts at serving customers and answering their enquiries while holding firmly to the legs of the gazebo as it rocked and twisted in the wind. At around two-thirty the rain subsided, the skies cleared and at last there were more people milling around the bus display and the remaining trade stands. Bertha, however, hadn’t quite finished. The gusts got stronger, seriously twisting and subsequently damaging the framework of the gazebo, we decided to take the structure down, pack it away and trade in the open. We may have now been without shelter, but under blue skies and the rain now gone we weren’t letting Bertha get the better of us! Apart from a magnet display stand being flipped in the air by a sudden gust all was well for the next forty minutes or so until the appearance of a very dark grey cloud warned us that more rain was imminent, At this point, it was decided to call it a day as we raced to pack everything into the van before the rain could do it’s worst. 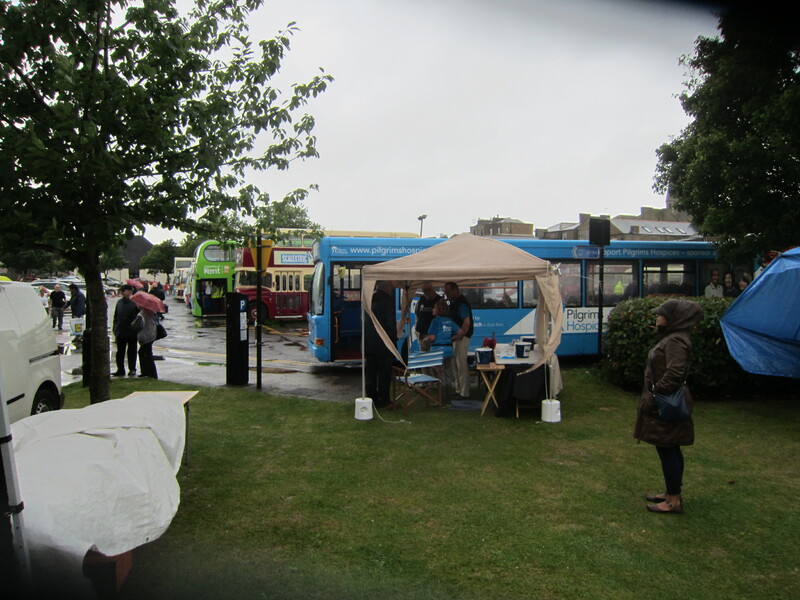 The rain went away as quickly as it had arrived, along with the customers, the rest of the stall holders and a few buses leaving Gina, Nigel and myself reflecting on the day over an ice cream. Were we defeated and down hearted? No way! Between us we’d met several of our customers, old and new, had a good day’s trading under the circumstances and had several laughs along the way. We’ll be back next year. Many thanks to all concerned in the organisation of this event, and special thanks to Nigel Coupe for his help in saving the gazebo! I think it’s time that Junction Ten developed a branch line. 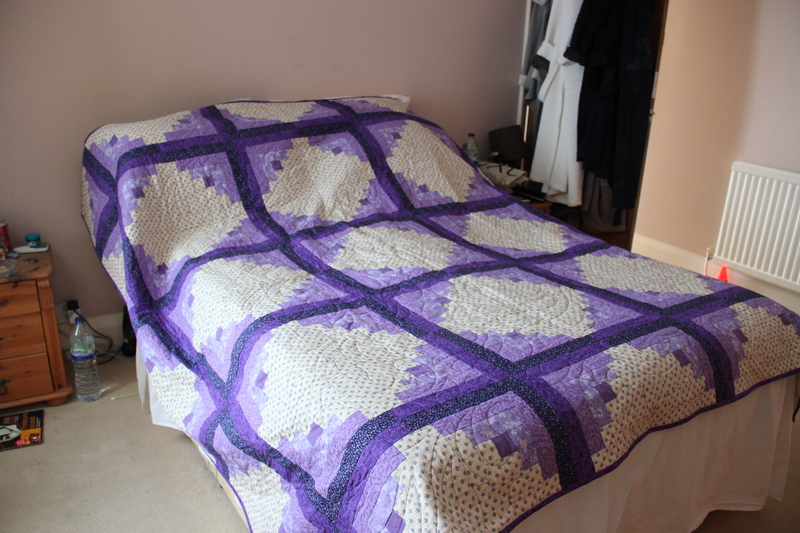 I love to make patchwork quilts and, a few years ago I was commissioned to make a quilt as a wedding gift. About 2 years ago it happened again and I would like to share the result with you. When you look at the finished product you could be forgiven for thinking that they are quick to make – let me enlighten you. After initial discussions about colour and pattern with the recipient, I went home to sketch out the design and calculate the amount of each colour fabric that would be required. It then took me nearly 17 months to find all the fabrics. Purple is not an easy colour to co-ordinate and, what appears as purple to one person is not the same colour to another! I had enough of two of the fabrics in my stash and I found two more dark fabrics fairly easily but, the light coloured fabric, which had to be fawn/beige with something small and purple printed on it proved elusive until we went to Horsham on a completely unrelated visit. The pattern is called Log Cabin and it is a traditional pattern and there are many different arrangements for the blocks. Each block is half light and half dark, representing the light and shadow from the fire. 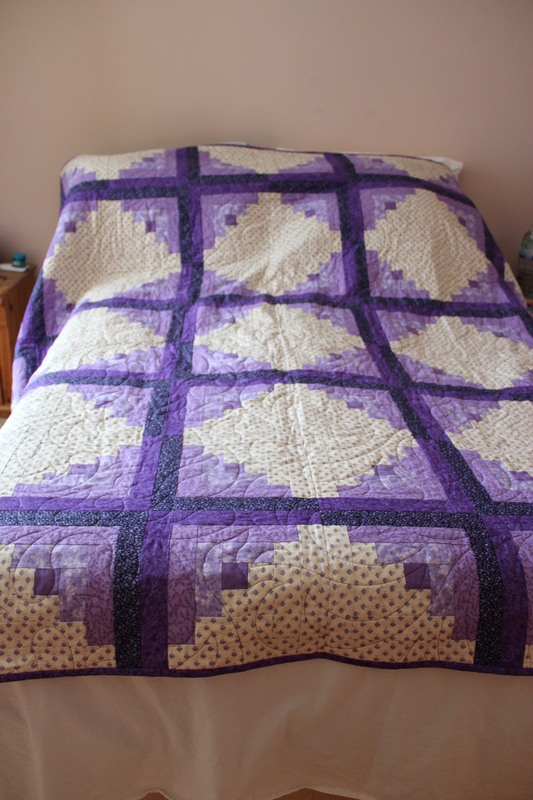 The quilt is made up of 64 blocks, each 10.5 inches square. I make no apologies for working in inches, all my measuring equipment is in inches and I see no point in renewing it all just to satisfy the metrication police! 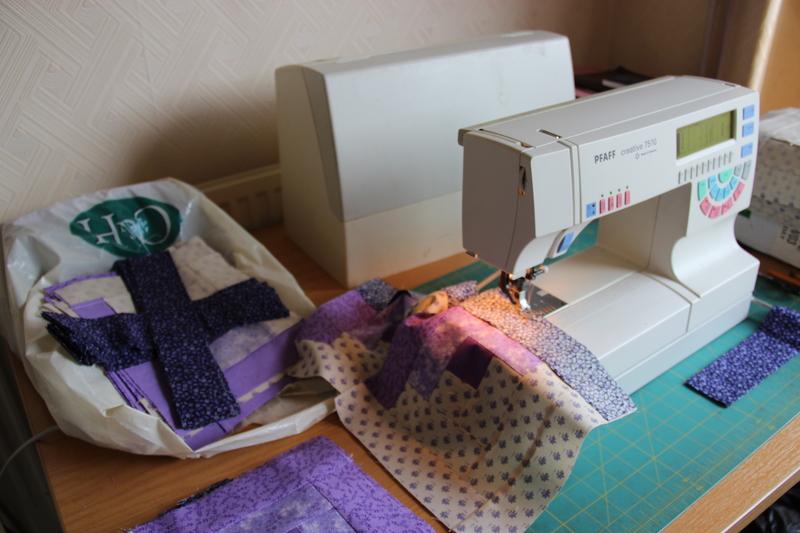 Cutting the fabric is time consuming in as much as accuracy is required. 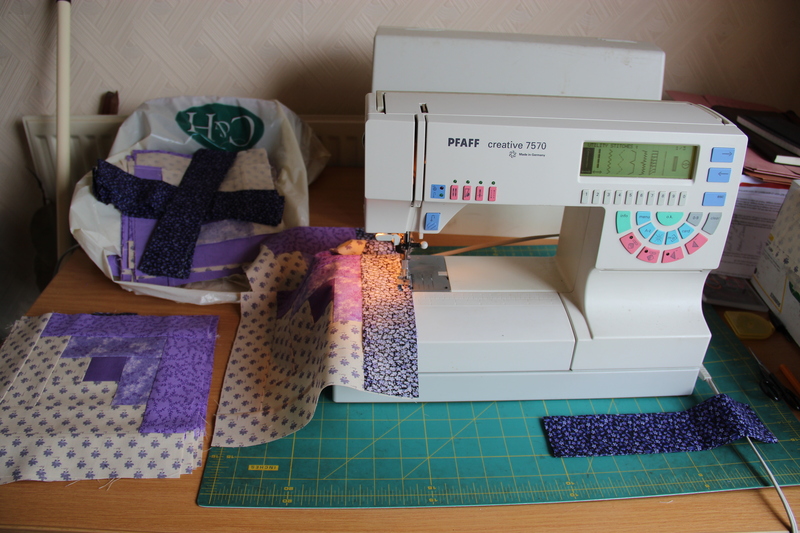 Seam allowances are included when cutting but they are not marked, they are sewn by eye using part of the foot on my sewing machine to give an accurate seam. I usually cut and piece about 16 blocks at a time, after this my eyes and fingers get a little tired and that is when mistakes creep in. Once all the blocks are completed you can lay out the final design referring to the initial sketch if necessary. The blocks are then sewn together to make rows and the rows sewn together to produce the finished quilt top. Finally the three layers, backing, wadding (the fluffy bit in the middle) and top are sandwiched to form the patchwork quilt. This is embellished with a sewn design that holds all three layers together. Finally the quilt has binding attached to all the way around to give it a nice finish. Et voila! An heirloom is created. I will be putting up other creations over the next few months, some of which will feature photographs printed on fabric. Keep checking out the site, there will be something for everyone.